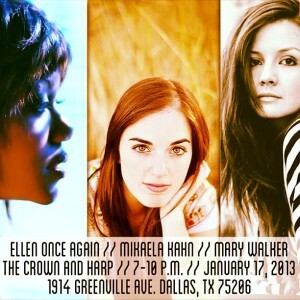 The Artist Collective presents the Female Singer-Songwriter Showcase at The Crown and Harp in Dallas. We’ll be showcasing three amazing talents each Thursday night for just $3 (extra tips welcome!). On January 17th, we’ll have Ellen Once Again, Mary Walker, and Mikaela Kahn. Doors open at 6pm and the show is from 7pm to 10pm. The show is 21+ and we’ll have $3.50 Texas craft beers. You can also order fish, chicken or shrimp with chips that will come from our sister restaurant, Daddy Jack’s, next door. There is free parking behind the Billiard Bar and across the street. If you’d like, you can also stay for free and watch the late night bands play from 10pm to 2am.